Our Work Center system offers a multitude of possible layouts. The desks have a heavy-duty steel frame with open legs. 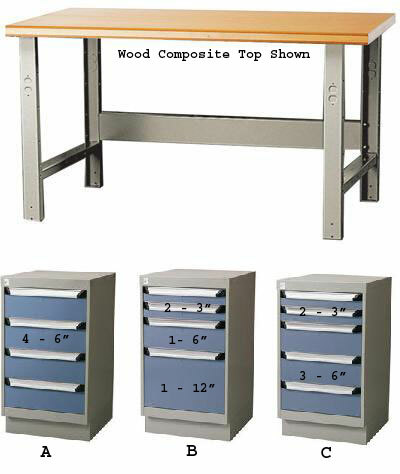 Cabinets are 18"W x 21"D x 32"H. Factory-welded storage pedestals include 100 pound capacity drawers mounted on a ball bearing mechanism. Standard frame color is light grey. A large variety of accessories and colors can customize your table, contact factory. Assembly required *Please select appropriate option when ordering.